A beautiful, romanticised but tepid biographical drama film by Werner Herzog of an incredible figure. 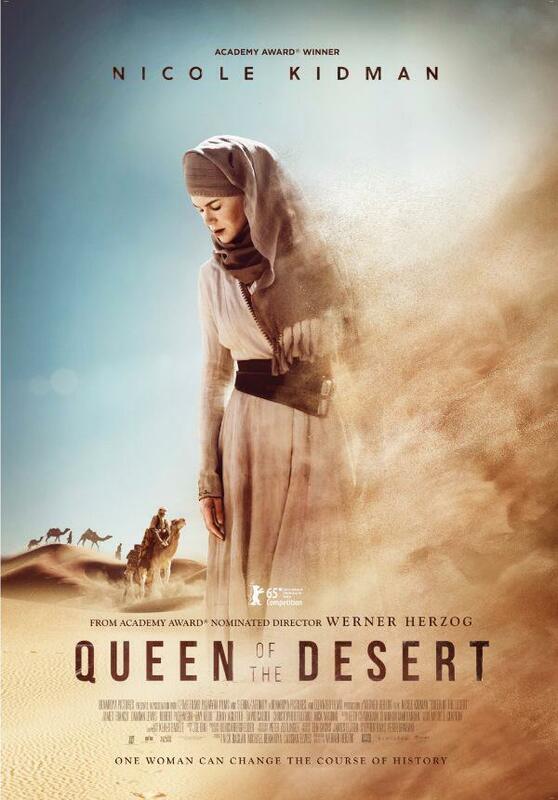 Gertrude Bell was brought luminously to life by Nicole Kidman in what may be one of her best performances in years. Kidman aged and matured Gertrude through the film 128 minutes with such conviction. She had captured Gertrude's awe towards the desert and her sense of adventure and discovery, but through it all, Kidman's sense of Romance (and romance) is impeccable. Her love and heartache for the two men in her life felt real and genuine more so with Damien Lewis rather than the miscast James Franco. Robert Pattinson was surprising, yet well cast, as Gertrude friend T.E. Lawrence. Herzog wrote and directed this film and his words (or perhaps those directly lifted from Gertrude's letters) were beautiful. The film had a languid pace and nary much (dramatic) conflict at all. Herzog was clearly more interested in exploring Gertrude's as a person rather than capturing the potentially more dramatic political conflict of the Middle East. And if not for Kidman's performance, this would have plodded even more heavily. Kudos also goes to the gorgeous cinematography of Peter Zeitlinger and rousing music of Klaus Bedelt.